Watch: PM tours south Tel Aviv following Supreme Court ruling on infiltrators, pledges to work to resolve issue. 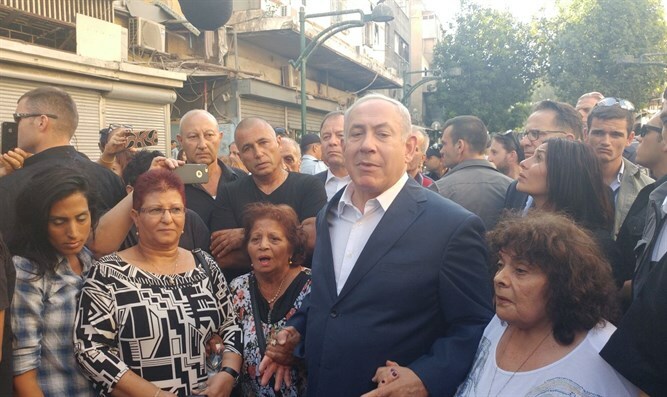 Prime Minister Binyamin Netanyahu toured south Tel Aviv on Thursday afternoon and promised residents that he would take action to return illegal infiltrators to their home countries or other countries willing to receive them. Although his government buitl a fence to keep additional illegals out, there are close to 40,000 who managed to enter Israel before the fence was completed. "We are here on the mission to bring the citizens of Israel back to south Tel Aviv. I listened to all the residents, and what I hear is pain and distress," Netanyahu said. The Prime Minister toured south Tel Aviv against the backdrop of a Supreme Court ruling that illegal infiltrators cannot be detained indefinitely for refusing to be voluntarily deported. He promised to set up a ministerial committee to resolve the situation. Netanyahu was joined by Public Security Minister Gilad Erdan, Culture and Sports Minister Miri Regev, and MK Miri Ohana (Likud). Earlier, Deputy Foreign Minister Tzipi Hotovely visited south Tel Aviv and spoke with residents. Minister Regev said that the infiltrators are not refugees. "People who arrive here by passing through two countries (the infiltrators reach Israel by way of Egypt and the Sinai, ed.) are not refugees. They are infiltrators. It is the residents of south Tel Aviv who have become refugees in their own country." Regev also slammed the recent Supreme Court decision. "It is inconceivable that a government cannot implement its immigration policy. We must pass a law bypassing the Supreme Court on this issue, which will allow the government to implement its policy." The Culture Minister offered three solutions. "We must start enforcing the law against employers who pay salaries to the infiltrators who work for them," she said. "We must inform homeowners who rent their homes to infiltrators that they will not be able to do whatever they want without supervision, such as turning one flat into multiple apartments." In addition, Minister Regev has proposed extensive reconstruction projects to restore the area. "The mayor of Tel Aviv-Jaffa is not really interested in the southern part of the city, and if the infiltrators were living in the northern [affluent] part of the city, he would probably have invested there and developed it a long time ago."